One of my absolute favorite topics on earth is kitchen renovation, and even though we finished our own several years ago, it’s still one subject I never get tired of. 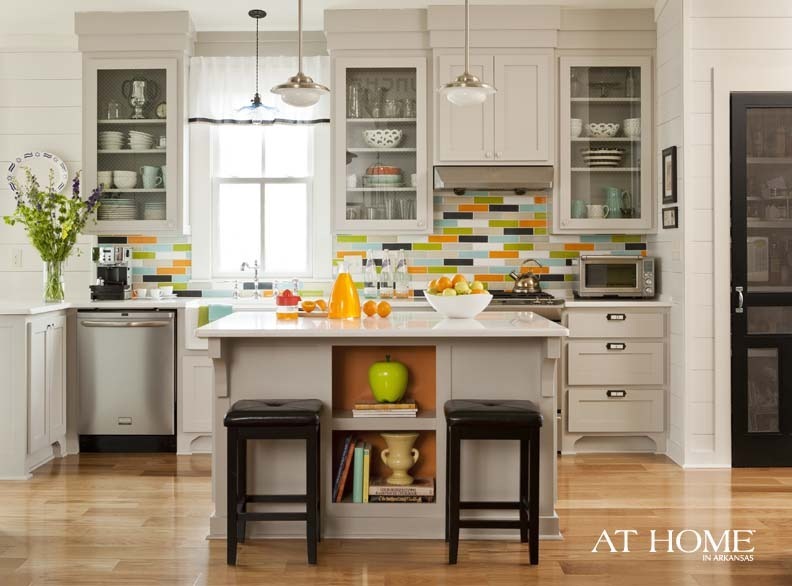 Today l’d like to welcome fellow home renovation lover and blogger Liz from It’s Great to Be Home on the subject of choosing kitchen cabinetry during a home remodel. 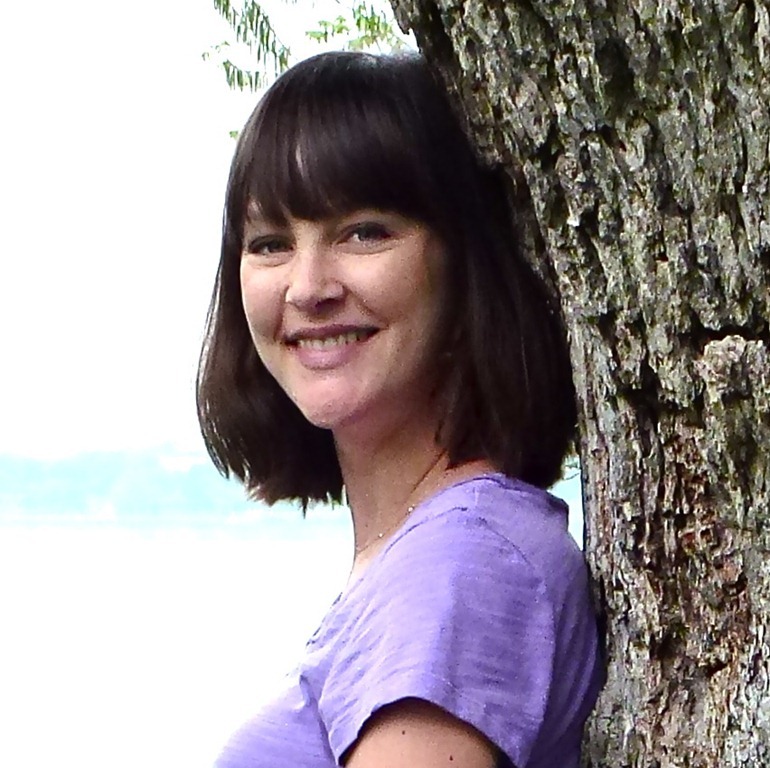 Liz and her husband are pros at flipping houses, in fact they just finished their fourth flip and I’m so excited to have Liz as a new monthly contributor, sharing her insight on all things home improvement. 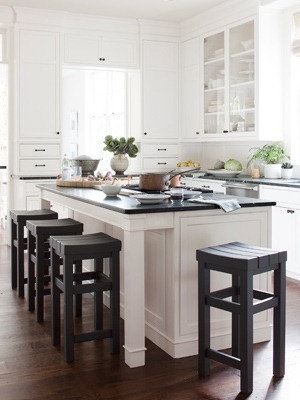 Today the topic is choosing kitchen cabinetry, take it away Liz! If you’ve ever tackled a kitchen or bath renovation then you know all about the onslaught of emotions that can be brought on by that prospect – excitement about having a fabulous space after the renovation is complete, nervousness about surviving the process, and sometimes total fear about the daunting task of choosing each and every fixture and finish. For those of you on the brink of a big construction project, I’m here to take the intimidation out of at least one aspect of your renovation: choosing the cabinetry. Cabinetry is often the biggest investment you will make during a kitchen renovation, so of course you want to get it right! There are so many considerations and decisions to make. Will you choose custom or stock cabinets? 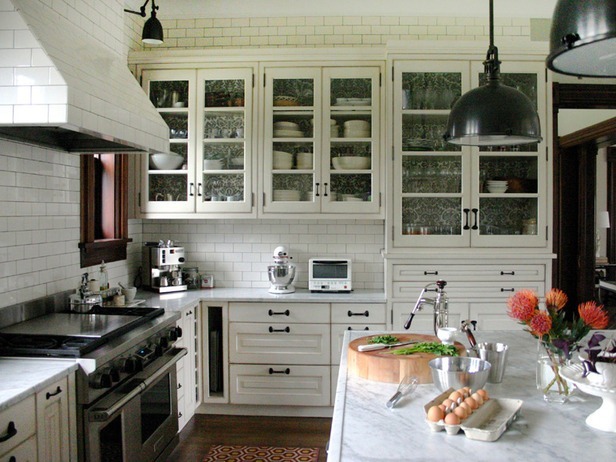 Should you chooser painted or stained cabinetry? How much should you set aside in your budget? The list goes on and on. However, if you arm yourself with just a little knowledge before you tackle the cabinetry conundrum the task doesn’t have to be scary or intimidating. 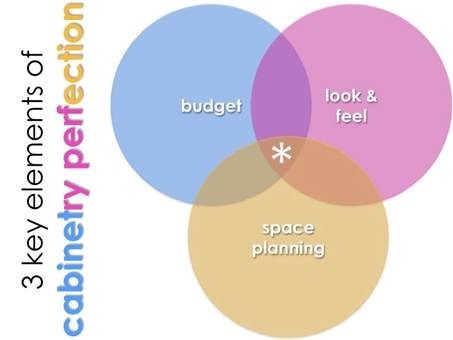 The key to having confidence in your cabinetry choices is all about finding the perfect balance between three key elements – your budget, the look and feel you’re going for, and making the most of what you have through space planning. How do you balance those three elements? Here are ten questions that will help guide you to that ideal balance between budget, look and feel, and space planning to achieve your dream cabinetry. Practical matters should be considered first (i.e., your actual needs), which are addressed in the first 5 questions. Then we’ll move onto the pretty stuff! 1. What is my cabinetry budget? You probably already have an overall budget in mind for your entire kitchen renovation – but have you broken that budget down into allotments for cabinetry, tile, hardware, fixtures, labor and everything else that will go into the project? Creating an itemized budget is the very first thing you should do, before you spend a single dime. Why? Because you don’t want to be that person that has a killer Viking range sitting in the middle of an empty kitchen – it’s all about spreading your pennies around, saving and splurging as necessary. 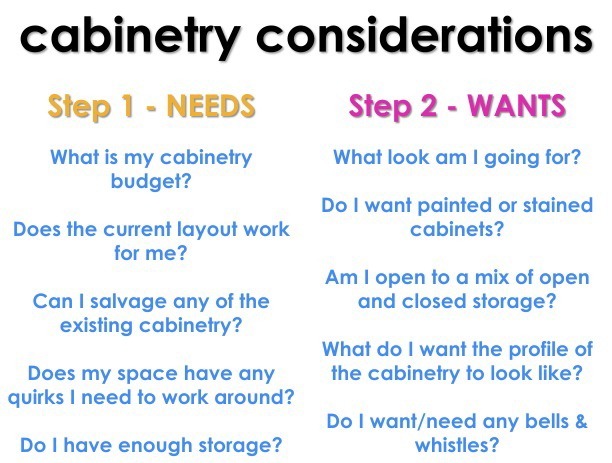 Keep in mind that you may need to make adjustments to your cabinetry budget (and possibly your budget in general) as you consider the next nine questions. 2. Does the current layout function well, or do I need to change it up? Whenever you remodel a kitchen you have the option of moving things around maybe you want to relocate the gas range to another wall or move the refrigerator or add some windows to bring in more light. Keep in mind that it will always be easier on your wallet if you keep appliances and fixtures in their existing locations – that way you aren’t paying to relocate plumbing and wiring, and you can possibly even salvage some (or all) of your existing cabinetry. But often the whole point of your renovation is to rework the existing layout into an arrangement that works better for you. That’s fine, just make sure you factor in the impact on the budget before you start moving things around. 3. Can I salvage any of the existing cabinetry, or do I have to start from scratch? We touched on this briefly above, but sometimes your existing cabinetry is in great shape, even though you don’t like the way that it looks. Don’t assume that you need to throw it all out and start from scratch! Sometimes you can get a whole new look by simply replacing the cabinet doors and drawer fronts, adding a new coat of paint, or replacing the hardware. Another great way to switch up your look while saving cash is to replace some of the cabinet doors with glass ones or with floating shelves, or simply remove the doors from a few cabinets for open storage. That being said, not all cabinets are worth saving. Some are just plain ugly, or maybe they’re falling apart – in the long run, you’ll be happiest tearing them out and starting fresh. But if your cabinets are in good shape, often the best solution is somewhere in the middle – salvage what you can, rearrange the cabinetry so that it works with your new vision, and fill in the gaps with new pieces. This is the approach we’ve taken in the kitchen of our current flip and it’s saving us a bundle – without sacrificing the overall look that we’re going for. 4. 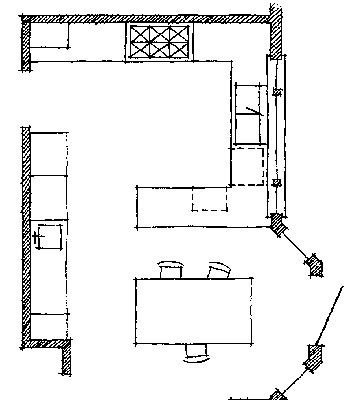 Does my space have any quirks or problem spots that I’ll have to work around? Maybe you have an awkwardly placed window or a fur down that’s housing part of your HVAC system. Take note of all of these quirks and make sure they’re reflected in any cabinetry plan that you come up with. You don’t want any surprises! It may be that these quirks dictate whether you can use stock cabinetry or must have some (or all) of your cabinets custom made. Knowing your options upfront will help you keep the budget in check. 5. Do I have enough storage, or do I need more? Have you missed having a linen cabinet in your bathroom, or is your kitchen in dire need of a pantry? Even if you’re keeping your fixtures and appliances in the same locations don’t think that means that you can’t go crazy changing up the cabinets themselves. Consider breaking up runs of traditional upper and lower cabinets with a few cabinets that run from the counter top to the ceiling. Or maybe this is your chance to finally rip out that soffit and raise your cabinets sky high, adding even more storage. After you’ve addressed your needs, it’s time to move onto the fun stuff – your wants! 6. What look am I going for? Whether it’s sleek and modern or rustic and homey, it’s impossible to create a kitchen that you’ll be happy with without having a vision of the finished space. If you haven’t already, now is the time to open a Pinterest account or start an inspiration folder to store images of your favorite spaces. After awhile, you’ll notice a theme to the images you keep saving – maybe you’re drawn to lacquered finishes, or floating shelves, or inset cabinet doors. These details will guide your choices throughout the renovation as well as impact your budget, so take notes and be as specific as possible. You might ultimately have to scale back some of your design plans for more budget-friendly choices, but knowing what you like will help you achieve a similar look without blowing your budget. 7. Do I want painted or stained cabinets? Or a mix of both? As a general rule, stained cabinets are more expensive than painted cabinets – this is because stained cabinetry must be made out of a quality wood whereas painted cabinets can be crafted out of materials as humble as plywood because paint will hide the material underneath. Of course, you can always drive up the cost of painted cabinetry by adding expensive hand-applied finishes like glazes so skip those luxuries if you’re trying to stick to a tight budget. 8. Am I open to a combination of open and closed storage? Design elements like floating shelves or open cabinets are great for two reasons. First, they can break up a solid run of cabinetry and add visual interest to your space and second, these elements can be cheaper than closed storage! The reason for the savings is that you aren’t paying for an expensive door or drawer front that has to be crafted by a cabinet maker. A carpenter can easily whip up a box with shelves for open storage, or you can buy floating shelves from a number of retailers and have them painted to match your cabinets for a seamless look that is easy on your wallet. 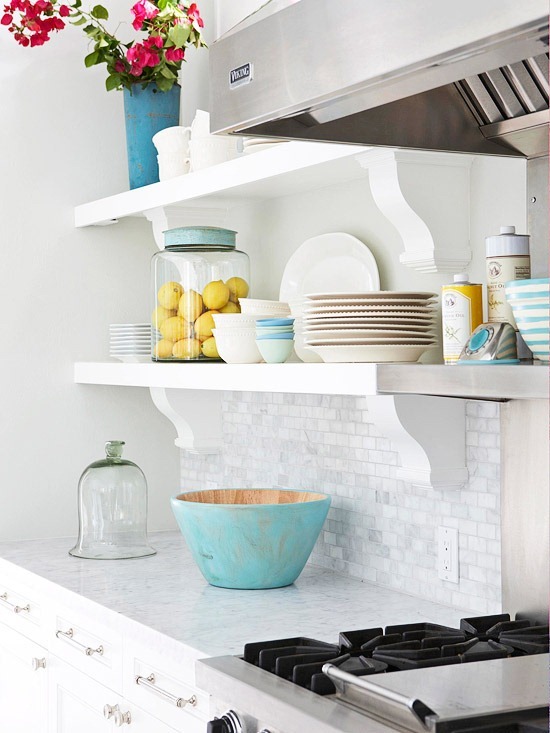 Open shelving can also let gorgeous tile take center stage, or act as an affordable solution to an awkward area where a cabinet or bank of drawers doesn’t really work. 9. What do I want the profile of the cabinetry to look like? Do you want inset cabinetry (where the drawers and doors are flush with the cabinet frames) . . .
. . . or a full overlay (where you can’t see any of the cabinet frame and the doors and drawers are all touching). . .
. . . or a partial overlay (where you can see the cabinet frame between the doors and drawers but they are resting on top of the frame). These options range from the most expensive to the least expensive, because of the amount of precision that goes into crafting the cabinetry. 10. Are there any bells & whistles that would make my life easier, or that I just want for the sake of wanting? Have you always hated losing your pots and pans into the abyss of a corner cabinet? Then a lazy Susan might be just the answer. Pull-out trashcans, recycling centers, racks for baking sheets, special bins for dry goods, soft-close drawers . 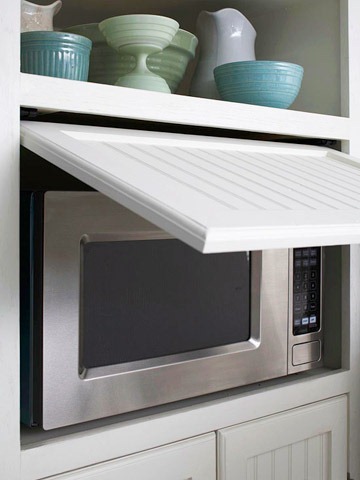 . . the list of upgrades and gadgets that you can add to your cabinetry is truly endless. If the budget allows, a few of these bells and whistles could add extra function to your new space. Wow, thank you so much Liz for sharing your knowledge and experience on the topic of choosing cabinetry in a kitchen renovation. So much to consider, right? You can look forward to more articles from Liz on the topic of remodeling in the months to come! Liz is a house-obsessed chick that ditched her day job as a lawyer to flip houses and sell real estate with her husband. Liz just completed her fourth flip and is about to start her fifth! You can follow along with all the madness at her home renovation blog, It’s Great To Be Home! 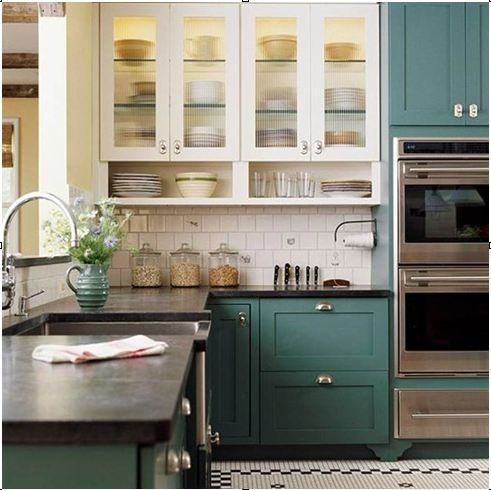 How many of you have wrestled with the decisions required in choosing kitchen cabinets for a remodel? 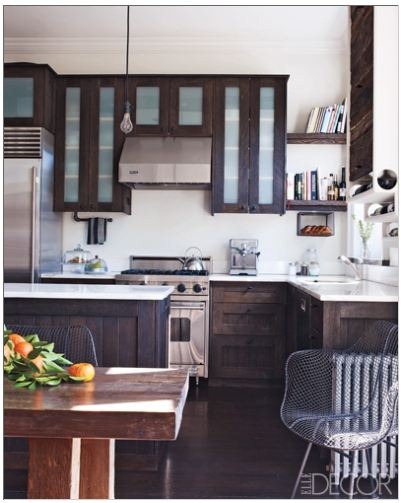 Did you gut your kitchen and start fresh or find clever ways to repurpose what was there? Got any tips to share? Let’s hear them! We are preparing to start on a kitchen remodel. We don’t have the nicest cabinets but we plan to reuse and repaint them to save money. I do plan to splurge on the counters and hardware though. All these inspirations pictures are just beautiful. Love kitchen remodels! But, there are so many variables to consider! When renovating my kitchen it came down to style, space limitations, function, and budget. Space limitations probably forcing us to be the most creative. These are great tips! Thanks, Liz! We aren’t ready to tackle any huge projects in our house yet, but the kitchen feels daunting. It’s a 1959 bungalow and the cabinets are tiger maple veneer (at least that’s what someone told me!) with big round brass knobs. They’re pretty orange-y but decent. I’m afraid if we gut it and replace with a brand new kitchen, the house will lose its retro charm. I mean, that’s why I chose it in the first place! We had our kitchen remodeled last year and had a hard time choosing cabinets. My husband really liked reddish cherry, but I didn’t. I’d seen some great super dark wood kitchens that looked great though. But we have a really small kitchen, and finally decided that cream colored cabinets with brown glaze would really open up the space without leaving it feeling boring. Here are some pictures–we love our new kitchen! Centsational Girl has become a “must read” item in my blogroll. Why? The articles are friendly, informative, INSPIRING, and beautifully written. This one on kitchen decision making is wonderful! When my husband and I gave our kitchen a lift with paint and new counter tops, the garbage can became a BIG decision. I wanted a big, deep, single bowl sink, but the plumbing would have made it impossible to keep my trash under the sink. (NO visible trash allowed!) So I chose a double, integrated sink, which I LOVE, BTW. This is great, that white kitchen from House Beautiful looks amazing…wish I read something like this two years ago… when we gut our 1950 kitchen and put up a new one… Hopefully I’ll write a post on it one day. This was a great read for me- we are building a new house, and it’s almost time for me to sit down and pick out options! Any chance you may do a post on selecting options when building? It’s a bit overwhelming!! Such useful post as I am planning a new kitchen right now! Liz, loved your post about cabinets! So many details, but info about painted vs. unpainted, and cabinet doors over the top rather than precision fitted where very interesting. I want to save money to use in spots where I REALLY want it, so your information was terrific. Any chance you will do a post on backsplashes? Good job! We are on the same trip here, kitchen remodel underway, all cabinets have been taken down and slate floor completely ripped apart! We have had the floor levelled and retiled so far. Now comes the tricky part………this post came just in time as a reminder to plan, research, plan, research before choosing the right products, like everyone else we have a limited budget. Excited to take our current project to the next phase. Great tips! Picking our cabinets was easy – in fact, stumbling upon the perfect cabinets for our house was what prompted the remodel in the first place. (we were considering moving, a new kitchen was the compromise for staying put!) We even agreed totally on the countertop choice. Now we’re stumped with the backsplash, of all things! so many options! Awesome info and appreciate all the integrative views of varied kitchens!! Love options!!! Our home improvement project is storage space, better understood as, trying to Create Some!!! Thanks for the tips today, you’re cent-sational alright!! I don’t read that many blogs, but CG and Liz’s “It’s Great to Be Home” are 2 that I frequent. How fun to find them both connected here! Liz, I love what you did with this article. So informative and logical. Beautiful pictures, too. Good work! We are going to give the Board and Batten a try in our kitchen area, and if we like it, we’ll expand to the foyer! Thanks for your great blogs on that project. I’m keeping my fingers crossed that ours will look as good. That Home Depot card sure would come in handy for that project!!! What great ideas for the kitchen. Up to now, I hadn’t really considered open shelving but it would make sense for items kept next to the stove i.e spices, oils, vinegars and cooking wines – which often come in wonderful bottles – and are sometimes used extemporaneously while cooking. Right now, I’m doing a bathroom remodel – the inspiration of another of the Centsational Girl’s blogs – and we had to have the cabinets specially done since the depth of the counter is so small. We’re adding a bit of flash with an under counter placed glass bowl surrounded with rope lights. We’ll share pictures at some point. That $50 would be used to ease our budget and buy some Behr paint. Thanks for all the inspirational ideas. Great blog and great links. Great Post Liz! Tons of good information. Looking forward to getting to virtually pick your brain more as you share your knowledge! I am taking on an old remodel with metal cabinets, but refinishing them because they are so solid, but mixing in a couple specific oak cabinets. I loved the blog, I’m still formulating and love all the ideas. Perfect article. I’ll be sure to share with my clients to help them find some direction before remodeling begins. Wow thanks for all that! I found some great handmade cabinet knobs too that i thought I might share. Thanks for sharing this information. 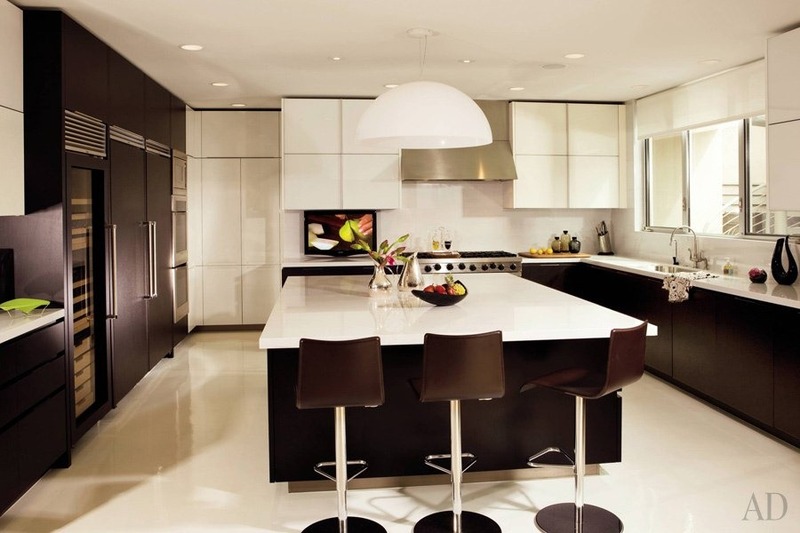 I have been seeing the results of great kitchen remodeling and it is all near Tempe, AZ. Keep up the great posts. I appreciate it!